Step into my entry hall where all that glitters is definitely not real gold but I hope you’ll still feel a big, warm welcome! I am so happy that gold tones have made a comeback in home decor. If you’ve read this blog for any time at all you’ll know that I am a big fan of blues and greens but I have always loved using touches of gold and red as well. This Fall I’ve been busy changing things up a bit to give my entryway a warm feel for the chilly days ahead. It all began with the wall color, the same tan tone I have in my living room with a Valspar Brushed Pearl Finish painted over that base color. 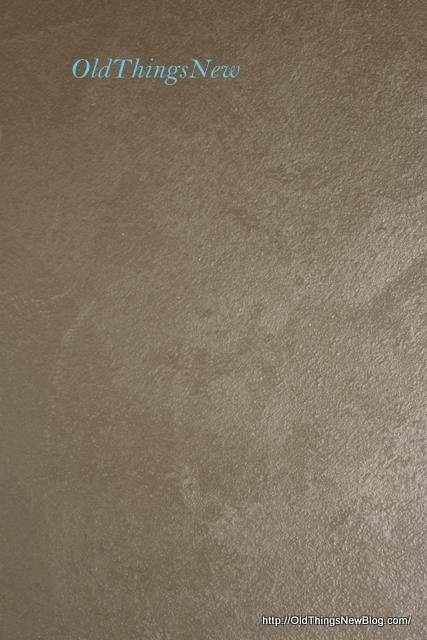 This finish is very subtle, unlike the sponge paint that was previously on this wall, and I think it adds just a touch of elegance. FYI: Lowe’s doesn’t carry the same color I used in my entry hall any longer but if you look at the link to the Brushed Pearl finishes, “Simply Elegant” looks pretty close to what I have here. 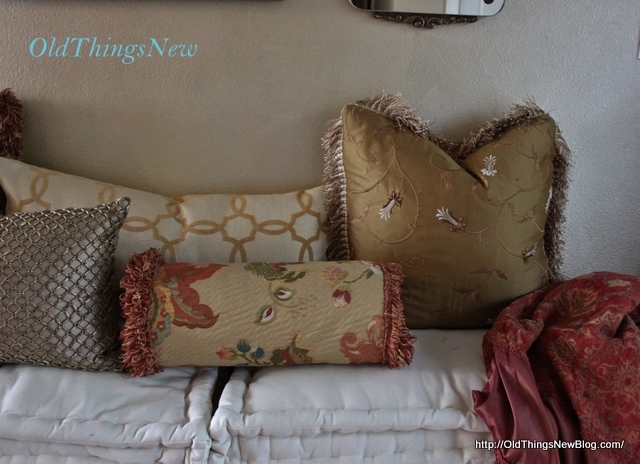 The first thing I did to welcome Fall was to take off my summery linen pillow covers, exposing the heavier Fall fabrics beneath. 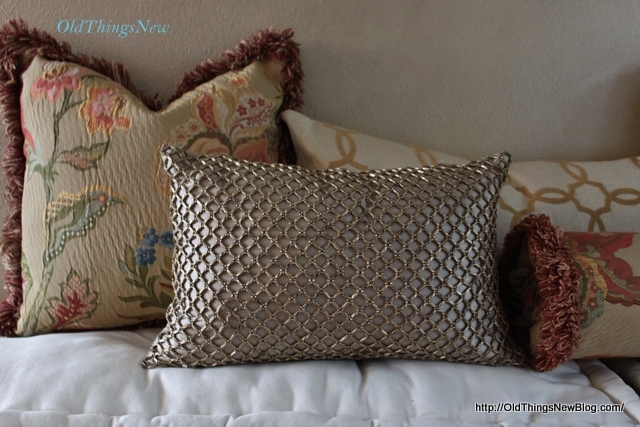 I don’t buy new pillows, I just swap out pillow covers for each season, saving money and space. This is a bench we picked up at our local Habitat Re-Store. I’ve left it unpainted for now as the wood is nice but I’m contemplating painting it Pottery Barn black. What do you think? I’m open to suggestions. It’s nice that the lid on this piece opens for storing our scarves and gloves. 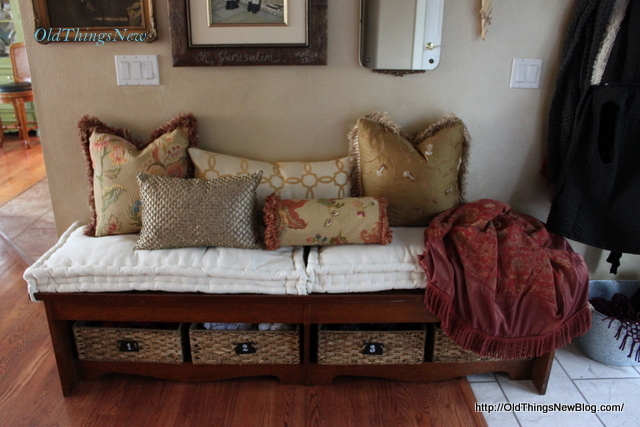 I’ve added two pillow top cushions for comfy seating and four baskets beneath for more storage. Next I started rearranging my wall to make space for a very special new arrival which I’ll share with you at the end! Each of my wall hangings have been collected over time and all have special meaning to me. I love antique frames and picked this one up at a local antique store. I think it’s funny when people comment that a frame isn’t in good shape because of the pieces that are broken off of it. The imperfections of this frame are exactly what made me want to take it home. 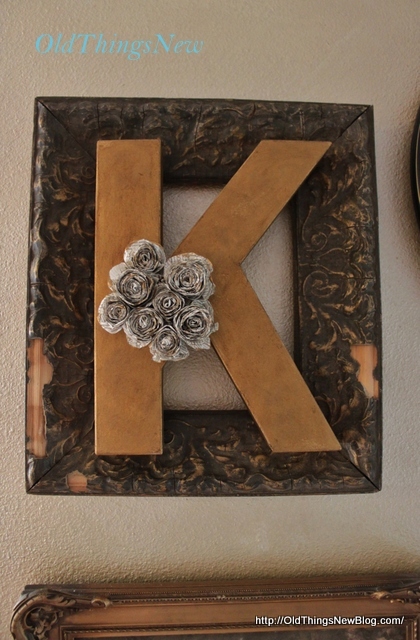 The monogram was a cardboard letter from JoAnne’s painted with gold paint and aged with dark wax. 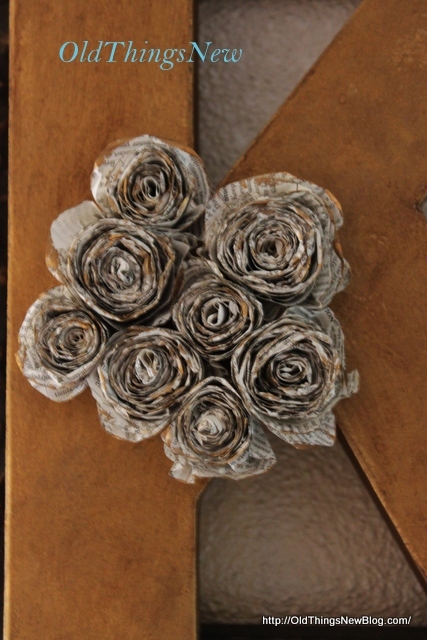 I added some rosettes made from old book pages and dry brushed them with a bit of gold. 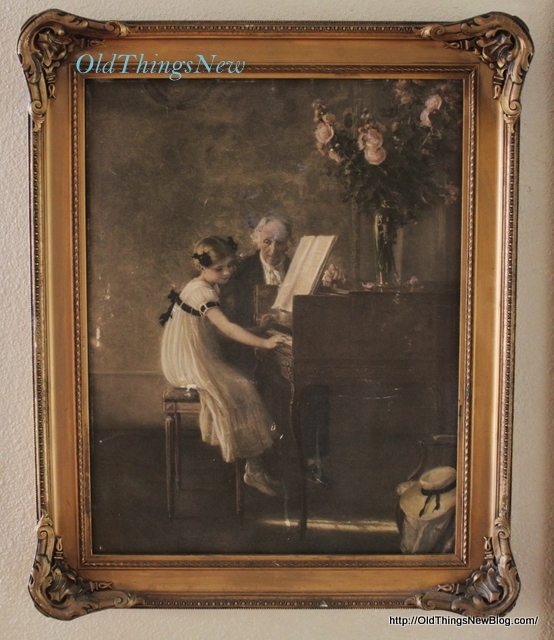 I was only a young child but I remember the day my mom purchased this picture of a little girl at her piano lesson. She found it at an oceanside antique store on our way home from a trip to southern California. For many years it hung over the organ in our home and was meant to be an encouragement to me to practice, practice, practice . . . something I didn’t really want to do. It later hung over my own daughter’s keyboard where she practiced for the pure joy of making music. Needless to say, she became much more accomplished than I. 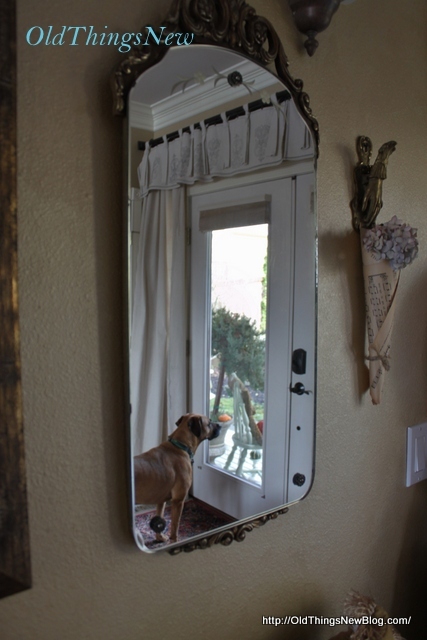 Antique mirrors are also something I’m drawn to and this little one is perfect for that one last check before I head out the door! 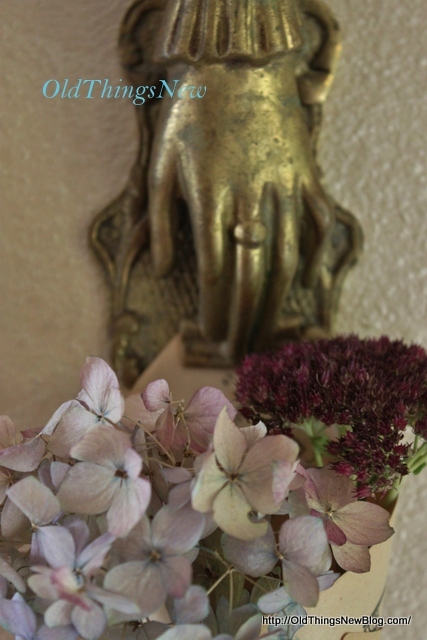 This sweet little brass hand was one of those things I just couldn’t pass up and how lovely it is for holding a few flowers from my yard. This is an oil painting we purchased in Israel in 2007. I first saw this painting through a shop window on the Cardo, the main street through the old city of Jerusalem. I was so touched to think of the brave soldiers who protect the nation of Israel praying at the wailing wall for their own protection, that it brought tears to my eyes. The shop owner, the artist himself, came out of the shop to talk to me and when he saw how moved I was he offered to give me the picture. Of course I couldn’t let him do that but I did purchase it and had it shipped home. The oil paint used in the wailing wall portion of the painting has actual crushed wailing wall stone mixed into it. I later came to find out that the artist is quite famous in Israel and throughout the world. His paintings hang in many prestigious places, including The White House. If there is anything pure gold about my entry hall, this is it! 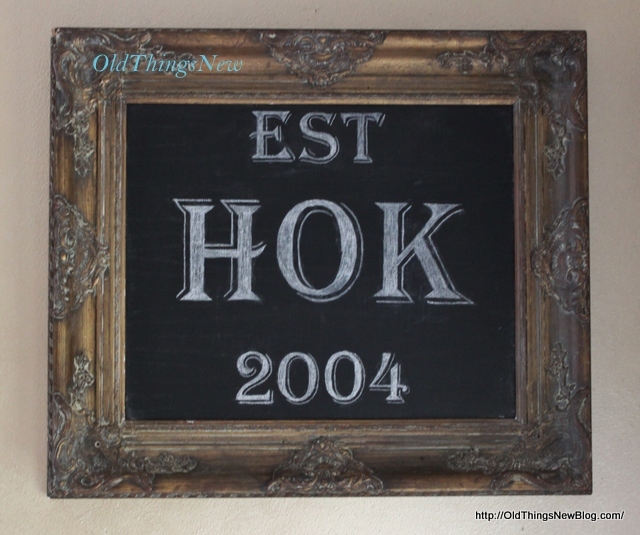 Next is another old frame I fell in love with at another antique shop and made into a chalkboard modeled after one I saw at Worthing Court. 2004 is the year we bought the home we live in now. Suzy’s tutorial on how to transfers letters to chalkboards is just great! I look forward to doing more chalkboard art in the future. 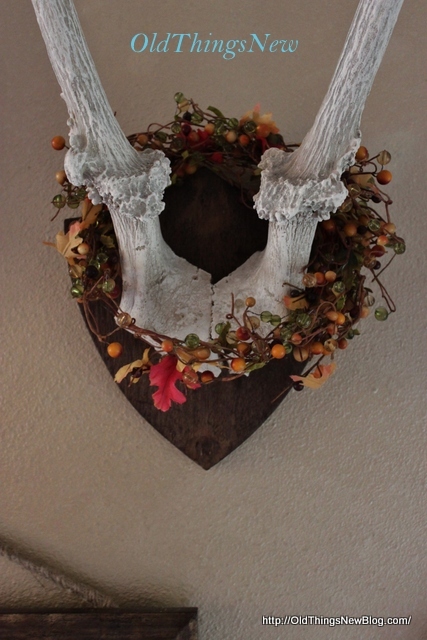 Finally, my most recent purchase and something I find to be such a fun addition to my entry hall are these lovely horns! 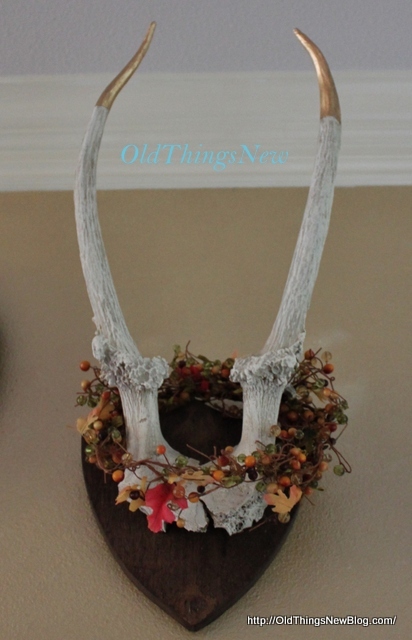 I thought they were supposed to be antelope horns but they don’t look like any of the pictures I’ve seen online, so I don’t really know what they are. Can anyone tell me? This is a before pic of our friend John (you remember the photo bomber from my last post?) attempting to attach them to his hat. 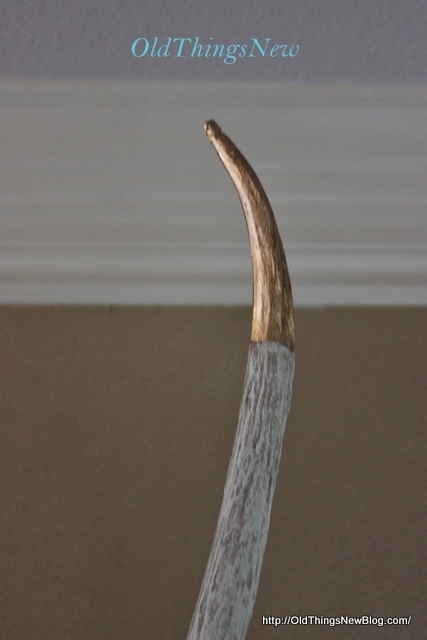 This is the after, with the plaque cleaned up and stained, the horns bleached to remove the greenish tinge and the tips gold leafed. Aren’t they amazing? Did you notice how the sunlight catches the gold on these horns? And it’s a cloudy day! I think these horns are going to bring great joy into my life! Haha! 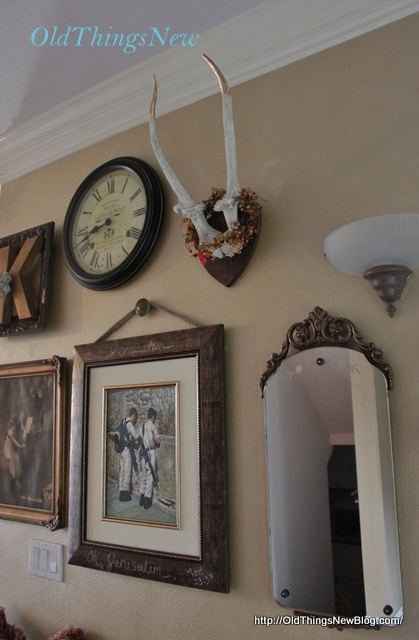 I know it isn’t everyone’s style to have horns hanging in their home. 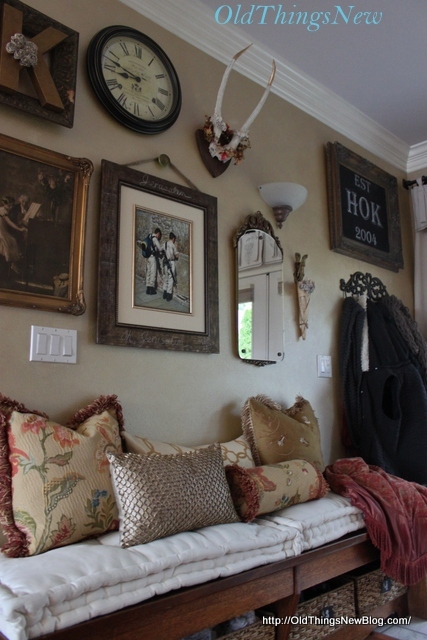 I guess that’s why they call my style Farmhouse Glam! If you’re interested in finding out what your particular style is you can take a test right HERE. It has actually been very helpful to put a name to my style in that it has helped me to stay focused when I go shopping. I just like so many different things! Of course I had to add a little Fall wreath for embellishment! So that’s the update to my Entry Hall, and here’s Sasha, eagerly awaiting the arrival of company. Though I’ve resisted until now putting away the summer decor I’ve finally embraced the season and I’m enjoying the changes to my home. It will be nice to sit by the fire on the long dark winter nights ahead and sip on a hot drink. What a nice break it will be from all the outdoor work of Spring and Summer. I hope you are enjoying this season of life too. Your entry looks wonderful. You did a great job on your gallery wall! 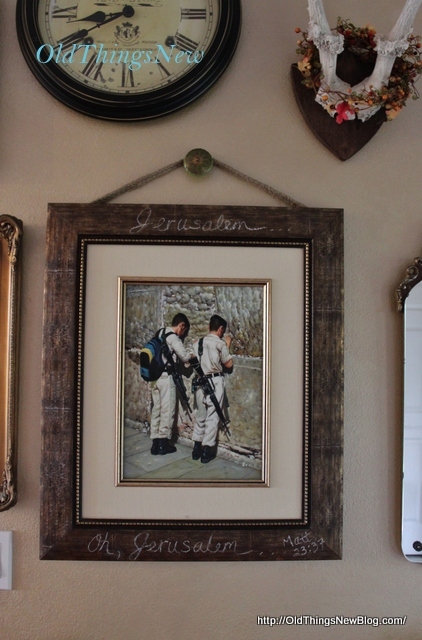 Such a cool story behind the painting that purchased in Israel! 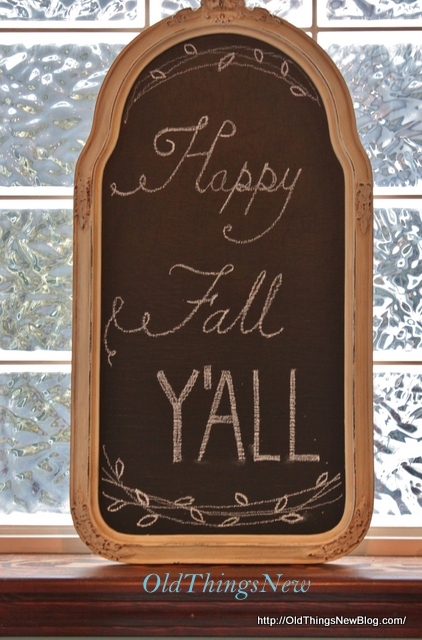 Thank you for the shout-out about using my chalkboard tutorial. 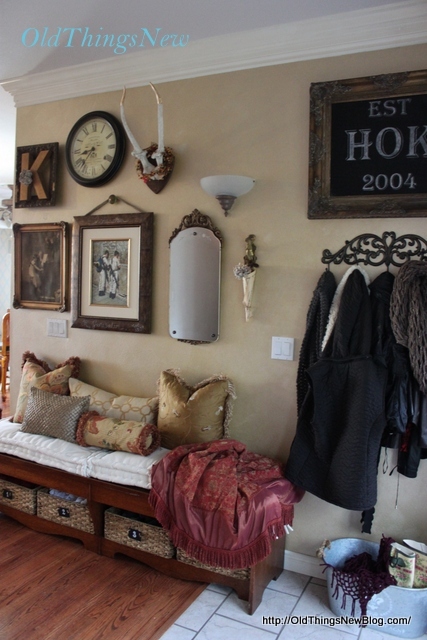 Love everything about your entryway! Can you give us more detail about the tan paint and glaze? I don’t think you should paint the bench. It looks great now and is so practical while still being pretty. In a few years when the painted furniture trend is over, you won’t have to strip it. I love how you’ve decorated your foyer, Patti! Love the wall gallery you’ve put together. That mirror is beautiful. Such a warm and welcoming view to come in the door and see. Love the bench and yes, I think it would look great black. Your entry looks lovely. there are so many wonderful special touches. 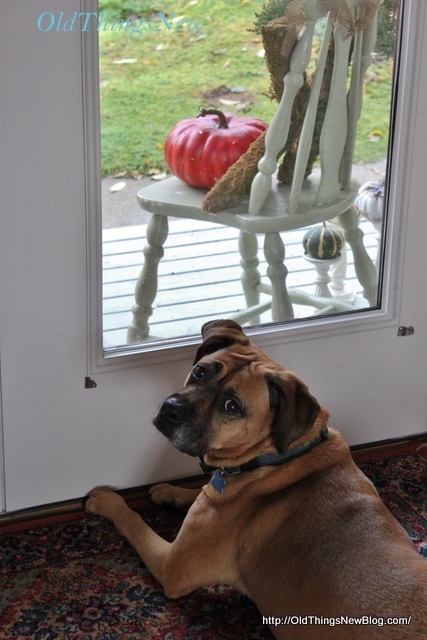 Your entryway looks great- love the warmth you’ve created. I like your wall finish and all the art objects. The portrait with the little girl at the piano is precious. I can see the bench painted black but it may change the personality of your display. I wonder if you paint the baskets black if that would look good? Fun to contemplate! Such a beautiful foyer!…I love all of those gorgeous pillows and the gallery wall is sensational….such a beautiful place for your family and guests to see when they enter your beautiful home!! This is really gorgeous! What a great mix of pieces. Your entry is beautiful! Thanx for joining THT. Love your entry! The wall looks great, love the warmth feel of it! Lovely entry way! You did a great job decorating, Patti. Thanks SO much for sharing at the Frugal Crafty Home Blog Hop! What a beautiful mix of pieces! So pretty and full of charm! Love the touches of gold! This looks so cute. Thanks so much for sharing with Wednesday’s Adorned From Above Link party. Saw you on dedicated house. 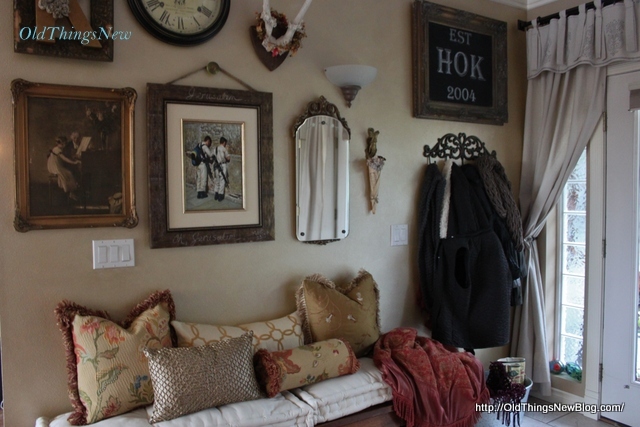 I love your gallery wall, they can be tricky, you did a great job! 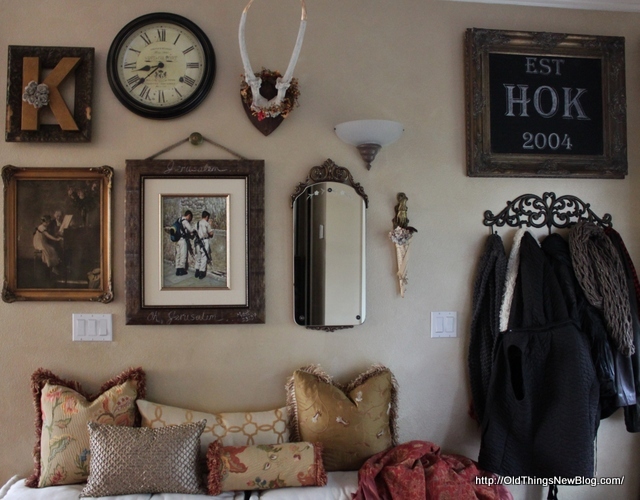 I love the mirror and the framed monogram!. The frame is perfect with all of it’s imperfections. The paper roses dress it up beautifully. You did a great job on your entry. Definitely warm and inviting! Thanks for sharing with SYC. amazing as a group. The mirror and old frames are my weakness. Lovely! Thank you so much for sharing it with us on Twirl & Take a Bow…hope to see you again this week! 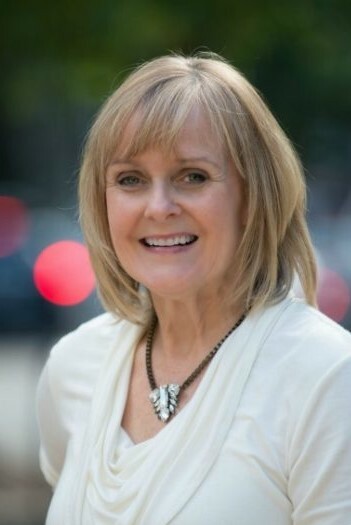 Patti, this is just beautiful. I love every detail. Thank you so much for sharing at Grace at Home. I’m featuring you this week!